I pinched my finger last weekend when I was helping a friend move. With pliers. It was a silly mistake, really. I was just trying to remove a bolt so we could disassemble a digital piano and get it moved out of the house. Of course, I knew I should use a wrench, not pliers, for the job. But all the wrenches I brought were metric and this was clearly an English size (Piano: 1, Liz: 0). The fastest way was to just go at it with pliers. Instead I clipped my finger. I kept working until I realized I had a pool of blood in my hand (Piano: 2, Liz: 0). But dish soap, water, paper towel compression, and a Band-Aid got me right back on the job. The piano got moved. 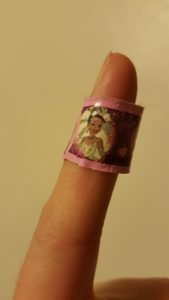 The next day I was out of bandages so I resorted to my Disney princess Band-Aids. Of course I have Disney princess Band-Aids. What single 30-year old doesn’t? Gosh, the things you guys ask me. So…I actually have them because several years ago, when I broke up with a guy, a good friend put together a break-up kit for me that included Disney princess Band-Aids. I don’t hurt myself that often, contrary to the supposed carelessness shown in this post, so I still have a few left. They generally cover a knee, toe, ankle, or elbow…something inconspicuous. But a few weeks ago I had to use one on my palm for a blister. And now this plied open finger. Both times, I got some interesting reactions among my circle of friends at church. Because the princesses are so flashy and bright, it drew attention to my little wounds. Many people commented on my Band-Aid and asked what happened and some just pointed and gave a sad face of empathy for my tiny little ouchie. My little bandage brought a sense of concern from others. A lot of us have wounds. I’d even wager so far as to say all of us. Most of the time, these wounds are hidden and we cover them inconspicuously. We may even have a generic sticky bandage, but it’s flesh-colored. As I thought about how people saw my little bandage, immediately felt for me, and wanted to make sure I was OK, I also thought about some of the other wounds I have. And those of others. I thought of those invited to speak in my church this past Sunday. One sister walked up with a cast-wrapped arm. Another had just gotten out of a walking cast. Those were visible princess Band-Aids, the hurts that we can see and I hope we are able to respond to. But another sister got up and shared about her struggle with anxiety and panic attacks. And another, whose story I’m only beginning to understand, spoke of a struggle in her life where she traded a hard experience for another hard experience, but one that will ultimately lead her on a better path. As they shared their stories, they pulled out their princess Band-Aids. They became vulnerable. It wasn’t weakness they were showing, but courage. Courage to share. And courage to let us know that there was something that needed healing. The remarkable thing is that when we see that bandage, we want to help and we want to understand. Vulnerability increases our ability to connect with people. I’ve been reading Brené Brown‘s book Daring Greatly lately, mostly because I feel like if I had Brené Brown in my head all the time, I would feel a lot less shame and anxiety about my life. In her book, she defines vulnerability as “uncertainty, risk, and emotional exposure.” So, pretty much, everything in life. She also says vulnerability isn’t just darkness or light. It’s not just sharing the bad things, but the good things as well. But, it’s just that the hard things are usually where we have a hard time sharing. I’m not encouraging a “social media information dump” from anybody, but I do believe we could all do a little better at opening up and building trust among us. In the past year, I’ve had way too many friends who have lost loved ones (husbands, children, parents, siblings, grandparents, or friends). But I’ve watched what vulnerability can do. Listening to them share their grief (whether personally, in blogs, or in social posts) reminds me of the pain I’ve felt in my times of grieving, and the healing that can come. Since sharing some of my personal struggles, many others have shared their own struggles and we’ve gained understanding, opened doors of conversation that had previously been closed, and helped heal each other. Others have problems many of us haven’t experienced, or that we may not quite understand, but opening up shows trust and leads to understanding. The hard things are, well, hard. And they’re hard to share. But there’s a heck-a lot of people out there who are struggling with the same thing, and if they’re not, they’re struggling with other things. But all of us have a desire to build connections with others and help each other out. I'm a little disappointed that there aren't any actual pictures of sunsets on here, or one of those annoying music players that start playing when you land on a website and you can't find where it's embedded on the page to stop it. But really what I wanted to say is that this is real true and thank you for sharing, both your band-aids and your vulnerability.